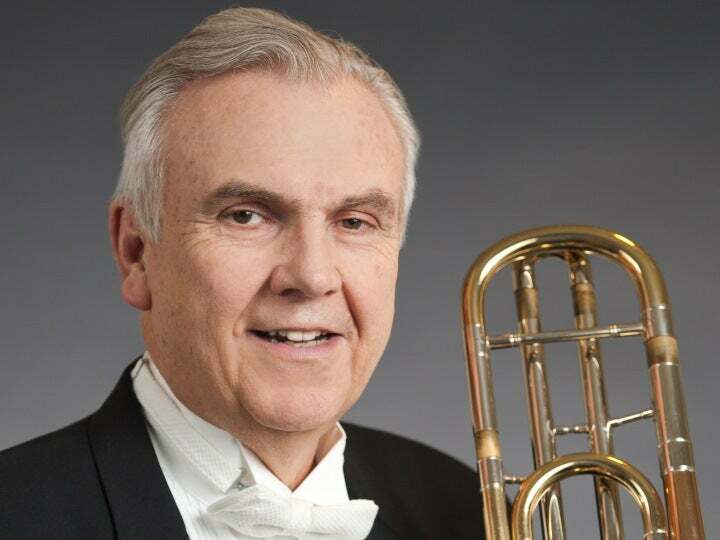 New Jersey Symphony Orchestra Principal Trombone CHARLES BAKER won NJSO’s second trombone position in 1972, when he was a master’s student at the Manhattan School of Music. 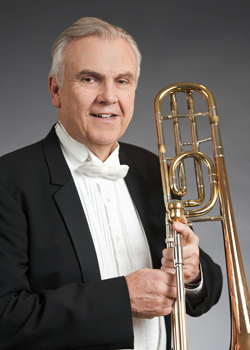 Baker was appointed principal trombone in 1975 by then-NJSO Music Director Max Rudolph; Baker was the Orchestra’s personnel manager from 1989 to 2003. Baker first learned to play the baritone horn in Salvation Army bands when he was young; he switched to the trombone when he was in second grade. The son of Salvation Army officers, he grew up all over the Northeast. His first trombone teacher was Philip Catelinet at Carnegie Mellon prep school; he later studied with Emory Remington (who has been called the dean of American trombone teachers) at the Eastman School of Music and with Ed Herman at the Manhattan School of Music. Baker has taught at Princeton, Rutgers and Montclair State Universities. In addition to his trombonist duties with the NJSO, Baker conducts the NJSO’s brass and percussion ensemble. As an ongoing commitment, he directs the Montclair Citadel Band of the Salvation Army. He has also been a guest conductor of the NJSO, Nassau Symphony, New Jersey Pops Orchestra and the Grand Teton Orchestral Seminar in Jackson Hole, Wyoming. He studied conducting at Eastman with Taavo Virkhaus and Milford Fargo. Baker’s musical family includes two brothers, both of whom play brass instruments. His wife, Michelle, is a hornist in the Metropolitan Opera Orchestra. The Bakers have three sons—the oldest is a drummer, the middle is a tubist studying at the Mannes College of Music in New York and the youngest is a high-school trombonist and football player. Name a memorable moment of your NJSO tenure. I’ve been with the Orchestra for more than 30 years, and a few things stand out. In 1990, the NJSO played Beethoven’s Ninth in Dublin, Ireland—that was a big deal for me. Through the years there have been many, many programs that were musically terrific; I couldn’t even begin to make a list. What goes through your mind when you are playing? I just try to make the best sound that I can—I want us [the low brass section] to make a good collective brass sound. What led you to an orchestral career? I was fortunate enough to wind up at the Eastman School of Music, which had the finest trombone teacher in the world, Emory Remington. I thought I was interested in more pops or jazz, but I learned that the symphony was it for me. What do you listen to when you’re not listening to classical music? I listen to English brass band music, choral music and jazz. More and more I love piano music, like Bach. That’s something totally different than what I do. If you were stranded on a desert island, what would you want to have with you? I’d want my wife with me. Michelle loves pop, so I’d imagine Maroon 5 and John Mayer albums would come with us. I’d love to sit down with Eric Ball, a composer of Salvation Army music who has been dead for a while. He is someone I greatly admire, a deeply spiritual person. I met him many times but I was young and didn’t know what to ask him. I’d love to meet him as an adult. In my high school yearbook, I put him as the person I most admired. He raised the bar big time. What do you do when you’re not performing with the NJSO? I grew up in the Salvation Army; my parents were officers. I’m still involved—I conduct the Salvation Army Montclair Citadel Band, a 25-piece brass band. We just recorded an album with James Pugh. He’s my favorite jazz trombone player. My wife plays French horn with the Metropolitan Opera, so it’s all music all the time. I’m also recently a grandfather—Sophie Michelle Baker is partly named after my wife. Is Sophie going to be a brass player? I don’t see how she can avoid it!